To place an order, click on the "Add To Cart" button below each title. Follow Scott McPartland & Dave Lewison as they delve into the science behind the chase! 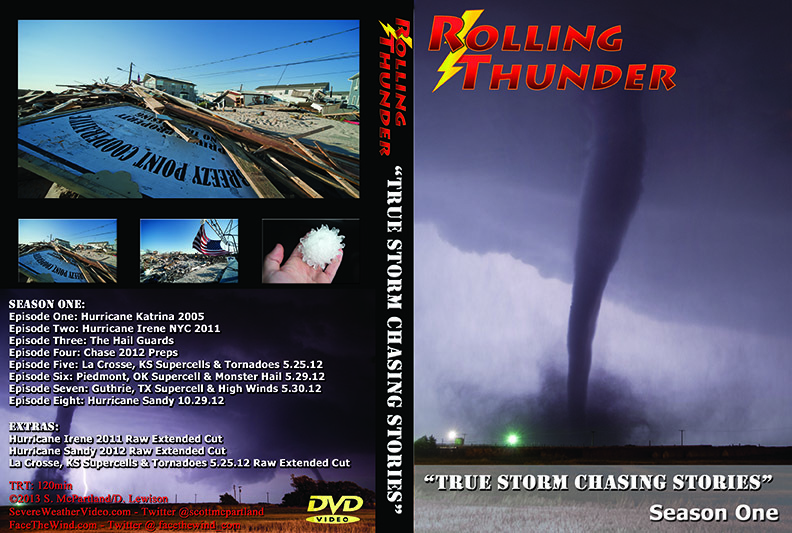 Rolling Thunder "True Storm Chasing Stories" chronicles some historic chases from years past, as well as our storm chases from 2012! We don't just show you the footage, we explain why each of these events happened, as well as what really goes into a chase. From the preparations, to the gear, to the storms themselves, we cover it all! All 8 episodes of Season One are on this DVD/Blu-Ray, along with 3 "extras" chapters which feature raw and extended edits of some of the more notable events we covered in the series. While all of season one is avaibable for viewing on my youtube channel, we felt that some might enjoy having an offering they could enjoy at home, on their TV's to get the full viewing experience. And at just $12 bucks (domestic shipping included!) for the standard DVD, how can you beat that? *EXTRAS* Raw Extended cuts featuring previously unreleased footage! 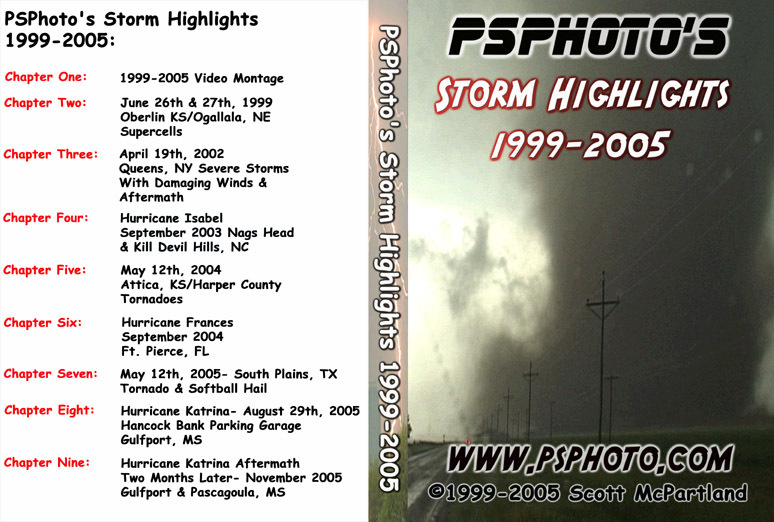 Purchase my 2 hour 2010/2011 Storm Adventures DVD via YouTube Rentals and watch it in full HD, right on your PC or MAC! Only $4.99 for an unlimited duration! In essence you're buying it and not renting it. Log into your Youtube account, and then click the link below to be taken directly to the Watch page for more info! 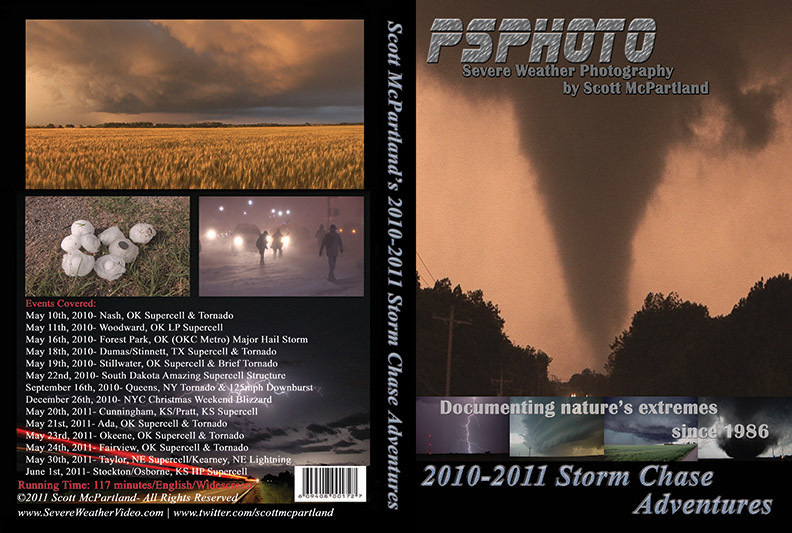 My 2010/2011 storm chase adventures DVD is packed with many amazing supercell storms, and tornado videos from the 2010 & 2011 season. On top of my usual mid west chase adventures, I have also included two New York City segments on this DVD as well. On September 16th, 2010 my neighborhood of Middle Village/Rego Park, Queens NY was hit very hard by a tornado and 125 mph downburst and as luck would have it, I was there as it all happened. My neighborhood was one of the worst hit in the city and we were cleaning up for months. Then, on December 26th, 2010 the NYC Metro was slammed by a blizzard the likes we have not seen in about 7 years. Fierce winds buffeted Manhattan at the height of the storm, and we were blanketed with over 20 inches of snow! Thundersnow even occurred at one point. I was there to document it all! Also, at the end of each of those NYC segments are graphics, radar & satellite animations, and narration by yours truly explaining how both of those events unfolded. Something else I am doing for the first time is I am making this years highlights available not just on standard DVD, but on Blu-Ray DVD as well. If you have a Blu-Ray player and an HDTV you can now view all my footage the way it was meant to be seen, in full high definition! Below is a run down on what the DVD contains! Dave Lewison and I had an amazing year! As some of you may know, May 2009 was historically quiet out on the plains with a serious lack of severe weather. But, our schedules were flexible so we held off on taking our chase vacation until June and WOW did it pay off! We documented many amazing supercell thunderstorms, along with two amazing tornadoes! One of which was the monster Aurora, NE tornado of June 17th! This is the first DVD of mine that is full 16:9 widescreen as all of the video was originally shot in HD. The quality is amazing! No worries though if you do not have a widescreen TV, the DVD will play just fine on a regular television, you'll just have the black bars at the top and bottom is all. This DVD set was professionally duplicated, not home burned. And the DVDs come in a black amaray box with vibrant cover & disc artwork. Total Running Time is 122 minutes. Why make it a 2 DVD set you ask? To ensure the highest quality video as I would have had to compress it big time to fit all on one DVD. Below is a complete run down on what the DVDs contain! -Spring 2009 chaser get together in the Florida Keys! -June 14th Ulysses, KS (Haskell County) TORNADO! -June 17th Beatrice, NE Supercells & Aurora, NE Monster TORNADO! Ride along with veteran storm photographers into the wrath of Hurricane Ike as they tell their amazing stories- from the Florida Keys to the Texas Coast. Experience the eerie calm eye and the raging backside eyewall in a city submerged. The fires, the flooding, huge waves pounding the seawall, Coast Guard Rescues, comparison with the 1900 Hurricane, scenes from Texas City and Freeport, satellite/radar animations, and more. 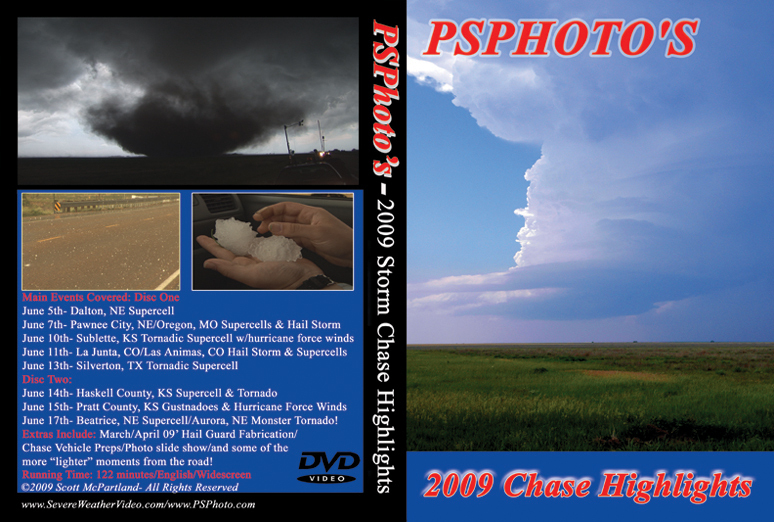 This DVD contains my personal chase highlights from the last 7 years. Basically it is a "meat and potatoes" compilation of all of my VHS tapes and DVD's that I've put together since 1999, as well as footage that has never been in any of my productions. Most notably video that was shot as we revisited the gulf coast in November 2005, two months after Hurricane Katrina made landfall. June 27th, 1999 Ogallala, NE. "Hailer"
Hurricane Katrina- Two Months Later, November 2005. Includes damage survey from Gulfport & Pascagoula, MS. When we put this DVD together, we wanted to do something that was a bit different that what has been done on other storm chasing related videos, and that was to give the viewer a complete “ride along” experience! 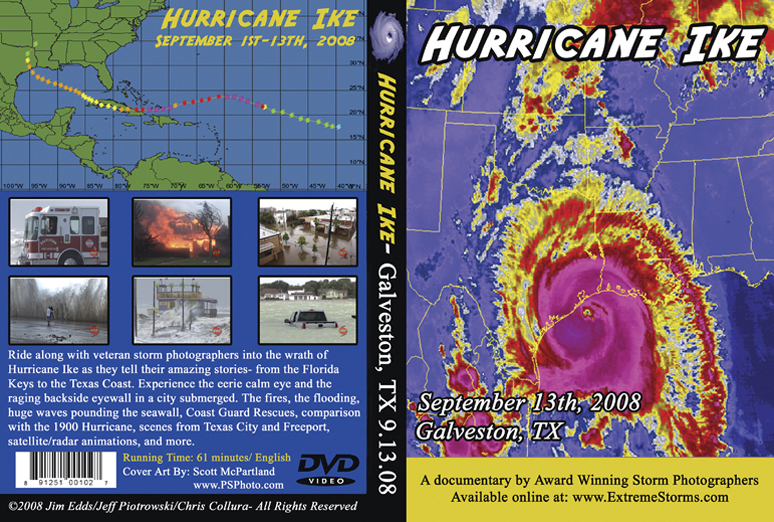 With Extreme Storms, you not only get an explanation as to why each specific event covered on the DVD happened, but we’ve also narrated it so the viewer can get a true feel for what we were going through as it was actually happening. 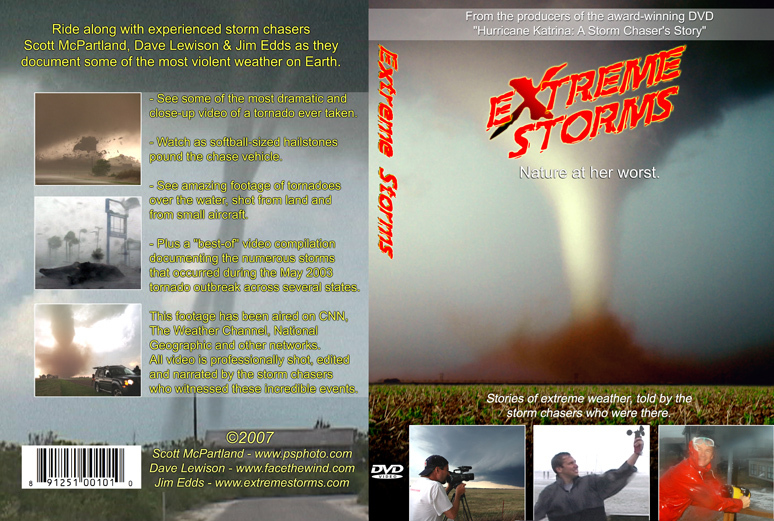 Jim Edds, Dave Lewison and Scott McPartland are credited with filming some of the most dramatic weather events ever caught on tape, and we showcase our best footage & related storm chases to the viewers on Extreme Storms. Ride along with experienced storm chasers Scott McPartland, Dave Lewison & Jim Edds as they document some of the most violent weather on Earth. -See some of the most dramatic & close-up video of a tornado ever taken. -Watch as softball sized hailstones pound the chase vehicle. -See amazing footage of tornadoes over the water, shot from land and from small aircraft. -Plus a “best of” video compilation documenting the numerous storms that occurred during the May 2003 tornado outbreak across several states. 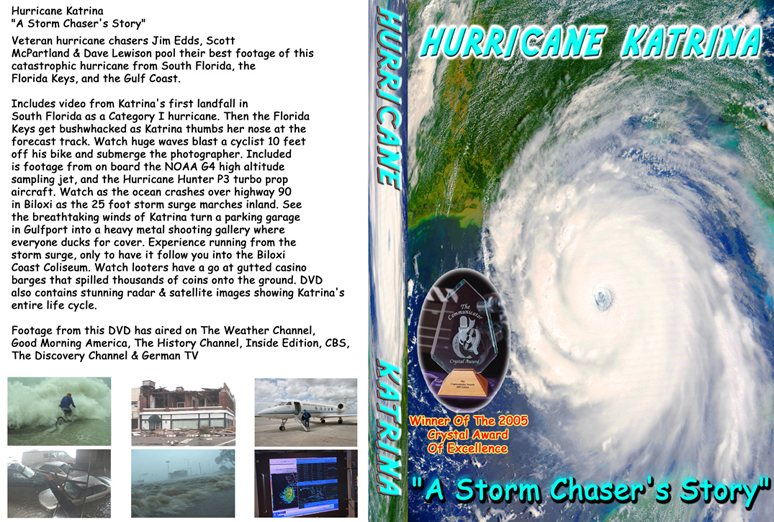 -Special Bonus chapter included documenting Hurricane Katrina's devastating landfall along the Mississippi Coast on August 29th, 2005 as well as Category 3 Hurricane Fabian hitting the island of Bermuda head on in September 2003! Hurricane Katrina "A Storm Chaser's Story"